One of the great things about colder weather is the hotter drinks! One of the better things about colder weather is the excuse/need to crochet so much warm and cozy goodness. A crochet mug cozy just combines these two wonderful things so effortlessly. Well, there is some effort involved but it takes less than an hour to whip up one cozy! Plus you are spending that hour crocheting a small rectangle, can you really call that effort? The Country Crochet Collection has continued to be super popular, so I keep adding to it. I might have overdone it with the alliteration on the name: Country Crochet Coffee Cup Cozy but I couldn’t pass it up! 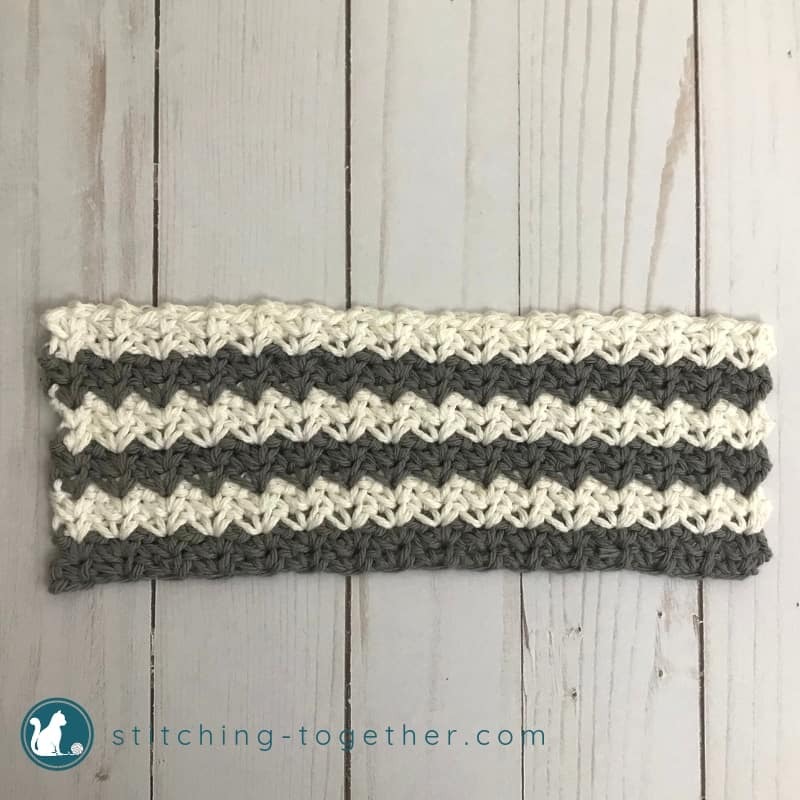 The spider stitch is easy and gray and white are hot neutrals right now. Of course, you do not have to use gray and white. This mug cozy would look adorable in a variety of colors to match your home or to gift. It take less than an ounce of yarn, so it is also a wonderful stash buster! 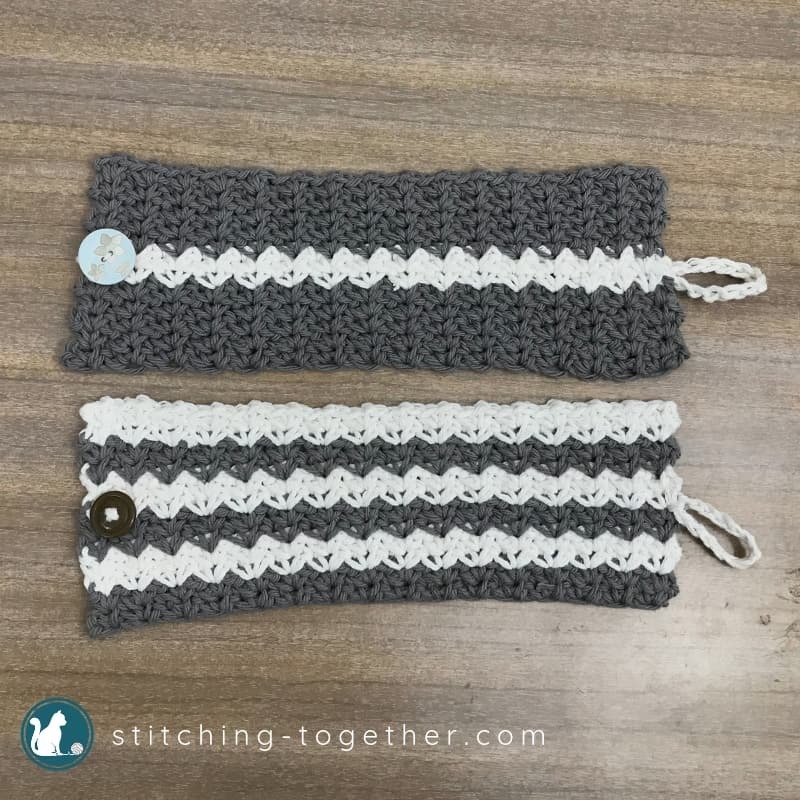 Instructions for both the completely striped version and the single striped version of the coffee cup cozies are below! 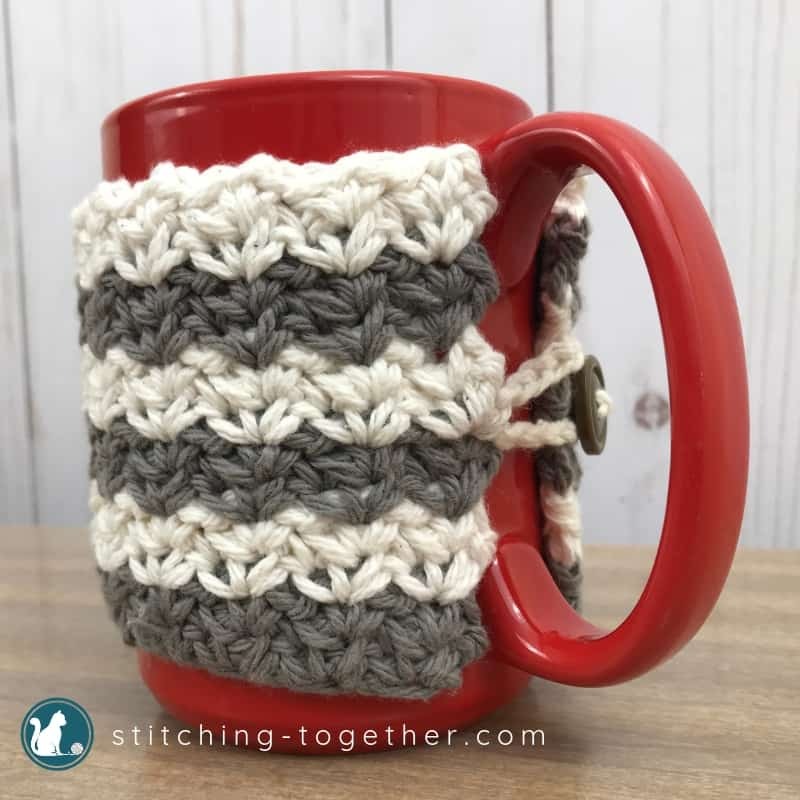 I mention in the notes that you can use a piece of elastic instead of yarn to make the loop to hold the cozy on the mug. I haven’t tried that myself, but I have had mug cozies that used elastic and it worked well. You’ll need a good old needle and thread if you go this route. I was able to use a tapestry needle and yarn to secure one of the buttons but had to use thread for the other button as the holes were quite a bit smaller. Save time and shop the materials online! Please see how to Crochet the Spider Stitch for a helpful step by step photo tutorial of the stitch. I made this crochet mug cozy to fit a mug that is 4.5″ tall and 10.2″ in circumference (3.25″ in diameter). If you want to adjust the size, add or remove a multiple of two stitches from the starting chain to keep it an even number. Rows can easily be added or subtracted to adjust the size. I find it difficult to carry the yarn not in use and up the side when working with the spider stitch so I did cut the yarn at each color change. Color changes work best when using the new color to complete the final stitch of the previous row. Using a 1/8 piece of elastic or something equivalent would also work well as a loop to hold the cozy on the mug. R2: do not ch 1 to start the row, (sc, ch 1, sc) in each ch-1 sp to the end of the row, turn. Repeat Row 2, changing colors every two rows for a total of 12 rows. Fasten off and weave in ends. Attach button at one of the ends of the cozy on rows 6 and 7. On the other end of the cozy, join yarn between rows 6 and 7. Ch the length needed to loop snuggly around the button. The number of chains you will need will depend on you the size of your cozy and button. Once the loop is the correct length, sl st the loop back to rows 6/7 and secure ends. R2-5: do not ch 1 to start the row, (sc, ch 1, sc) in each ch-1 sp to the end of the row, turn. R6-7: with CC, (do not ch 1 to start the row), (sc, ch 1, sc) in each ch-1 sp to the end of the row, turn. R8-12: with MC, (do not ch 1 to start the row), (sc, ch 1, sc) in each ch-1 sp to the end of the row, turn. Attach button at one of the sides on rows 6 and 7. 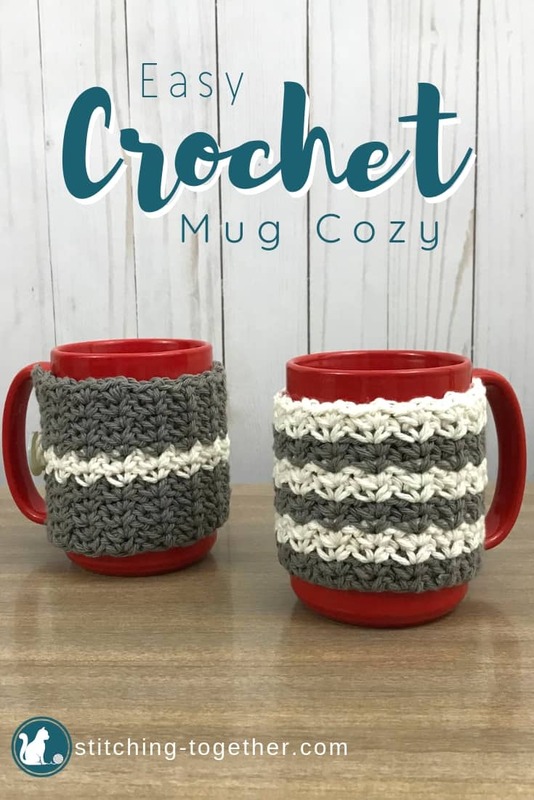 These crochet mug cozies are sure to gain attention to your craft fair table or they make a wonderful and thoughtful gift. Fill the mug with your favorite hot chocolate packets and a candy cane or two and you have a gift perfect for anyone at the office. 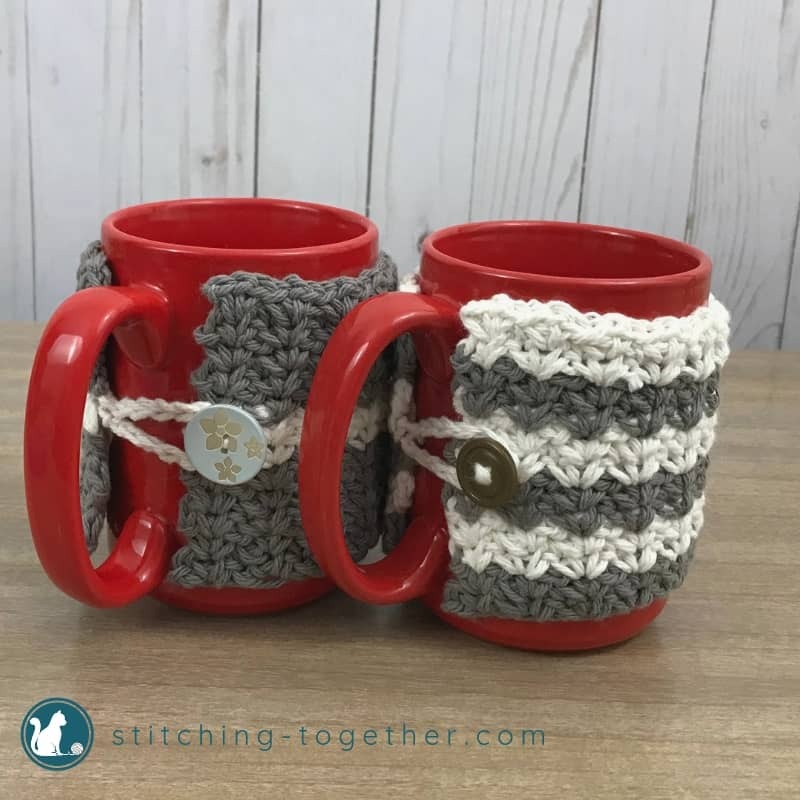 Who will you make crochet mug cozies for? I’d love it if you’d tag me on social and use #stitchingtog so I can see your finished projects!